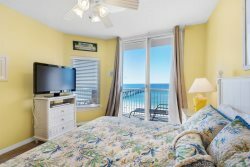 This Fantastic Condo is located on the 5th floor which is the perfect "Sanctuary" to take in beautiful Navarre Beach! Amazing Gulf beach views await you in this fabulous Gulf Front 3 bedroom, 3 bath vacation rental condo. Light and airy, this condo is sure to be a crowd pleaser.The master bedroom features a king size bed and a whirl pool tub in the master bathroom, so you can soak all your worries away. The guest rooms include a queen bed, and Double/Twin bunk located in the 3rd bedroom. This lovely condo sleeps 7 guests. Come take time out of you busy schedule to relax among the palm trees on beautiful Navarre Beach. Everyone on the staff was great! We love summerwind and Navarre and will be back many many years to come. Juan who did the chairs each morning was wonderful. Your maintenance staff was really on the ball, visible, and hard working. Loved our condo 501c! Loved the summer wind resort and hope to stay again soon. All Navarre staff are excellent! We come here regularly and will continue to do so. Hope to live here one day!